In 2018, when the technology is conquering the world and makes people’s lives easier it is impossible to believe that commercial real estate brokers are still using Excel spreadsheets, google docs and other unautomated resources. Doing things the old way has a huge impact on the brokerage industry which leads to a decrease in effectiveness, sales, and revenue of a broker. It happens that brokers spend most of their time editing, writing and managing data instead of closing the deals. The pipeline management is so painful because your prospects have to go through so many stages and it usually takes so much time that they eventually lose their interest or they never even got interested in the offer. More and more brokers start to appreciate the value of commercial real estate solutions and choose to automate the processes that took a big part of their time which is 6-10 hours per week doing admin tasks according to the recent research by The Broker List and Buildout. While some brokers tend to stick to the old-fashioned ways to contact landlords and tenants others are effectively leveraging various technologies to make their work process effective and fruitful. So, what are the commercial real estate technologies and software that brokers use? Having a CRM for brokers is not enough today. If the CRM that you’re using is not tailored for your needs, then you might miss out a lot of opportunities that CRM features provide. For example, there are a lot of solutions for brokers in the CRM for CRE that allows you to add and track property events, activities, deals, etc. When you’re responsible for selling or leasing a property by floors, it’s essential to have stacking plan visualization which allows you to see property space, tenants, owners, etc. Nowadays, CRMs for commercial real estate can have a lot of customizable fields (floors, building type, parking availability, etc.) and features (imagery, attachable files, etc.) which help you keep all the data in one place and utilize this data for making your future deals successful. A variety of CRMs for CRE have already implemented report generation, commission tracking, property searching opportunities, and even all these things are not making brokers very much techie. “Most brokers feel they are savvy because they have a CRM… They are on the edge, they have a CRM (sarcastically). …CRM is a staple to the business. Every successful broker has a CRM.”, says Rod Santomassimo Founder and President of The Massimo Group. A CRM is just one of the core components for your business to exist and prosper. It does help you solve a lot of your managing and data storing problems, however, there are a lot more other technologies that brokers are using to stay productive and relevant, and that is what Rod Santomassimo very well explained in Duke Long’s podcast. A CRM is an important tool to have, but it is not enough today. Let’s take Salesforce CRM. Today, Salesforce is one of the most used CRM systems in the world, however, brokers have challenges that are not easy to solve with Salesforce alone. E.g., you need to create a list of properties for lease in Dallas and its suburbs. You have zip codes, towns for each property in your CRM, but how will you get the list of properties that match your requirements? Sure, you can start by adding all towns/zip codes that meet your criteria, but it will take quite a lot of your time. 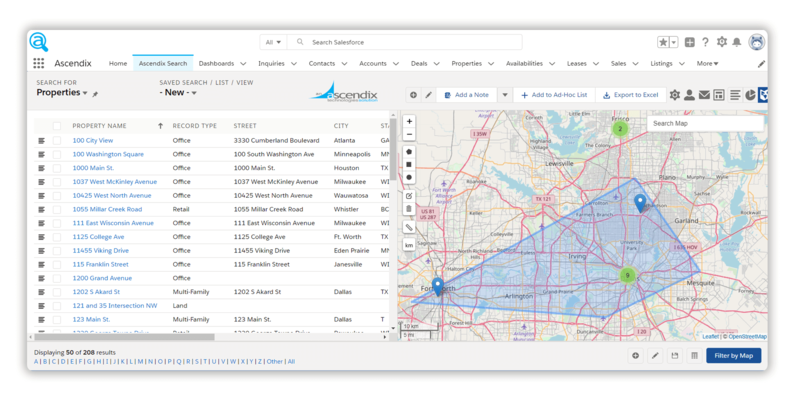 There is an app for Salesforce users called Ascendix Search which solves this challenge and helps in prospecting, lease expiration tracking and more. On the image below, you see the Ascendix Search interface. As you can see, Ascendix Search locates your properties on a map. You can draw shapes on a map to select the properties you need. A few clicks and you got the list you need. Some of those commercial property listings websites also allow you to create your own listings. However, you’ll have to pay to post your listings there and you’ll direct your traffic, not to your website, but the vendor’s site. Adding property listings functionality to your website is a whole different approach. Did you know that you can automate your property listings publication on your website? Today, it is possible to integrate your website and your CRM where you store property listings. It will allow you to manage your listings and have your data stored safely in one place. As the information about a building changes you can edit your listing in the CRM and the changes will be automatically applied on the website as well. In the CRM you can create, delete or customize all the property fields to your needs. The technology has gone quite far so now you can see who viewed your listings, what were the most viewed listings and when was the peak interest and much more. Also, adding your web leads to the CRM automatically is another time saver. It is very handy and prevents you from forgetting to add web leads to your CRM from your email. It allows you to track the performance of your listings and send follow-ups to those who were interested in the listing. One of the most important things to do before you even list a property for sale, rent or introduce the price to a tenant is to analyze the market around you. Depending on the location of a commercial building, size, type of building, floors, etc., the price will vary. Software for commercial comparables allows you to collect all the information and details of properties, landlords, tenants and owners, and analyze this data which includes sales history, demographics, client portfolios, etc. There are several property management software solutions on the market that a property management agency can use. Your choice of the software will depend on your vision whether or not you want to grow and scale your business or simply manage one company with, let’s say, 100 units. The property management software will be different depending on your goals. This type of software helps in managing the property’s accounting, operations, units, documents, perform property inspections, etc. Also, there are commercial real estate apps on the market that handle property management (both for iOS and Android). Commercial real estate reporting software is rarely a separate software or feature, and usually, it is included in the product you are using. There are various tools that can help you build customized reports, but they are not directly targeting real estate, in fact, those report building tools are used by any sphere. For example, Canva may be a free and paid solution to build reports, white papers, cards, posters, etc. Any third-party reporting software doesn’t make much sense, especially if you’re using a CRM for CRE or any other property management software. You keep and manage your data within those platforms why bothering yourself and transferring this data to some report-building software? This is the reason why most if not all of the CRE software solutions include reporting features which help brokers and agencies keep the record, analyze and compare the changes in the market or listings. To go even further, there are tools that let you create branded brochures, property tour books, activity reports, and any other real estate flyers. Buildout, most likely, is the most known software of this kind. The only downfall is its pricing that prevents some brokers from using the tool. Recently, our company introduced the Buildout alternative – Composer. The pricing is from $25 per user per month which makes our software available for everyone who wants to automate the report creation. It’s a solution that helps you create amazing brochures, commercial real estate flyers, lease comp reports and property profile reports. You don’t need to manually insert information like if you were using Canva or something. The data is extracted from a CRM, and then Composer generates a report which is available in PDF or PowerPoint. E.g., here is how a Property Availabilies is created: select the properties to include in the report, the report type and click ‘create’ button. That’s! It saves you precious hours for something more valuable and helps you to professionally showcase your availabilities. These lease management software packages help lease departments perform their accounting and processing, lease audits, repairs and monitoring and other operations much faster and easier. Starting from 2018 the visualization technologies are going to become an integral part of commercial real estate market. Drones and 3D modeling software help broker agencies and corporations leverage new nonverbal strategies to present the property in a game-changing light. According to Buildout report of 2017 “DNA of #CRE”, 41% of brokers are going to adopt drone video in 2018. Today, we can see that commercial real estate visualization market is indeed getting its momentum. It’s clear that in several years such technologies as mixed reality and augmented reality will change the world of the commercial real estate industry. These are the most common tools and technology in commercial real estate that successful brokers and agencies are using to be at the top. While a CRM may not be enough to be armed to the teeth with broker gadgets, it can definitely become a starting point to help you automate some of your work processes. Hopefully, this article has given you some insights on the commercial real estate software trends and will help you make a decision based on your needs.